N-acetylcysteine (NAC) is a chemically modified form of the dietary amino acid cysteine. Both cysteine and NAC contain sulphur, and sulphur-containing amino acids function as antioxidants, protecting the body from damage by oxidation. Other sulphur containing antioxidants include alpha-lipoic acid and glutathione. Glutathione levels are considered the most reliable indicator of the body's resistance to oxidation, and NAC plays a role in glutathione metabolism. While touted by many supplement manufacturers as a precursor to glutathione, NAC probably has more of a sparing effect on glutathione. That is, it neutralizes oxidants in place of glutathione, allowing glutathione levels to be maintained. Because of its role in preventing oxidation, NAC is potentially useful wherever oxidative stress is a concern. Tissue damage by oxidation is especially common in humans suffering from AIDS as a side effect of chemotherapy, and with drug overdose. 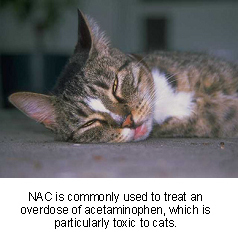 One drug commonly overdosed in small animals that NAC is believed to specifically antidote is acetaminophen. Acetaminophen, a commonly used anti-inflammatory and pain killer (e.g. 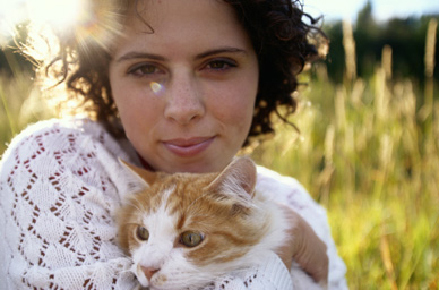 one common brand name is Tylenol®), is quite toxic to small animals, especially cats. NAC has long been used to counteract the anemia that occurs following oxidative damage by acetaminophen. While theoretically useful, it has not been proven effective in several clinical trials. Emergency room clinicians, however, feel that NAC administration in acetaminophen toxicity is beneficial. Most NAC is not used as an antidote to acetaminophen, but rather to neutralize oxidants produced in a variety of diseases. Chronic inflammation produces significant numbers or reactive oxygen species. NAC is used to counter the damaging effects of inflammation, particularly where delicate and vital organs are being damaged. One example is the use of NAC to help prevent oxidative damage to the spinal cord in degenerative myelopathy in dogs. Some research suggests that NAC also helps prevent kidney damage from lack of blood flow in humans, and it may have potential in the treatment of chronic kidney failure in geriatric cats. It can even be speculated that cats are more vulnerable to chronic renal failure because of their lower antioxidant levels. A surprising potential benefit of NAC is in the treatment of retrovirus infection such as HIV (Human Immunodeficiency Virus which can cause AIDS) in humans and FIV (Feline Immunodeficiency Virus) in cats. In humans, high levels of oxidants stimulate HIV replication while antioxidants such as glutathione prevent replication. Similar results were seen in a study of FIV in cats when NAC inhibited immune cell destruction and suppressed viral replication. A final potential application of NAC in small animals is the breakdown of mucus accumulation in the airways. In studies in dogs, NAC chemically reacted with and broke the disulfide bonds that hold mucus together, resulting in improved clearing of mucus and reduced mucus accumulation. NAC may thus be a useful treatment of respiratory disease with heavy mucus production. Why would N-acetylcysteine be recommended for use in my pet? N-acetylcysteine is used in veterinary medicine for the treatment of acetaminophen toxicity in cats and dogs. Other potential applications for NAC include the treatment of degenerative myelopathy, respiratory disease, chronic renal failure and feline immune deficiency virus (FIV). How much experience is there with the use of N-acetylcysteine in pets? N-acetylcysteine has been used in emergency medicine as an acetaminophen antidote for many years. Use of N-acetylcysteine in degenerative myelopathy in dogs is also common clinically. Treatment of chronic renal failure, chronic respiratory disorders, and FIV are new potential uses for NAC drawn from the research literature. NAC should also be considered as a supportive treatment following chemotherapy. While there is a large amount of laboratory research on the effects of NAC, very few clinical trials have been performed. Most trials have explored the use of NAC as an antidote to acetaminophen, with efficacy not necessarily being demonstrated. Clinical trials are entirely lacking for the benefits of NAC in degenerative myelopathy, renal failure, airway disease, and FIV. "...practitioners using NAC for degenerative myelopathy and acetaminophen toxicity report positive results." Despite the lack of clinical trials, practitioners using NAC for degenerative myelopathy and acetaminophen toxicity report positive results. Because damage due to oxidation is extremely common in a variety of diseases, there may be a tendency to simply use NAC preventatively as a routine dietary supplement. Surprisingly, however, there is some research that routine use of NAC in high doses in the absence of disease can actually promote the production of oxidants and free radicals. "...NAC is probably best reserved for clinical cases." Consequently NAC is probably best reserved for clinical cases. Where do I obtain N-acetylcysteine and do I need a prescription? N-acetylcysteine is a prescription supplement that can be ordered through compounding pharmacies. Veterinary supervision is required.